Mr. Pieric “Rick” de la Croix, CEO of Bomberg, talks with us about how he sees the current state of jewelry and his method for maintaining a successful brand. On this occasion to present in Mexico the Bomberg Skull Rider, the new timepiece based on the Bolt 68 that portrays the relationship between the Swiss House and Harley Davidson, as well as the one of a kind custom motorcycle which celebrates this commercial connection, CEO Rick de la Croix visited Mexico to lead the festivities. 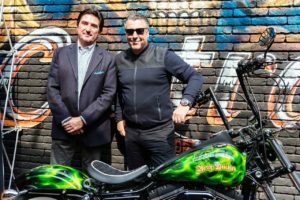 In light of this event, celebrated in the Harley Davidson capital of Mexico City, we spoke with Rick de la Croix, as expected, of watches and what separates Bomberg from the rest. Revolution: How you see the current state of watchmaking? Mr. De la Croix: I am very critical of the watchmaking industry and its present state. Today it is very much dominated by industrial groups where the art and craft of the industry created by Breguet 250 years ago is dying, because money is more important that tradition. This trend is killing towns in Switzerland that depend on this industry. And these major brands, that take the jobs out of these places and put them in other countries to industrialize the process, want to continue using the phrase “Swiss Made”. I as a proud Swiss, feel very offended. These days money talks. Everybody wants to make money quick! We are killing the industry, killing jobs. The Switzerland that I knew, when visiting my grandfather, no longer exists. All that’s left are towns almost abandoned. I am very critical (of the watchmaking industry’s situation). For me, the watch is an emotion. I don’t use a watch to know the time. As hours and years goes by, this passage of time scares me because I watch as every second is lost. R: What roles does Bomberg play in these times? Rick De la Croix: I am trying to use my brand as a means of leaving something important to my children. It’s a dream that I have had for four, almost five years. They have not all been successful because I strayed from what I know best. I was a successful distributor and nowadays I am a manufacturer who does not have relations in every country nor the knowledge to do so. I have made very expensive mistakes. I am not the kind of person who feels sorry for himself and sheds tears over his errors. My tendency is to improve and make adjustments. If I lose a million dollars, I know that it is not going to return. What I am going to do? I am not going to cry! R: Tell us about one of those episodes of learning and success for you and Bomberg. Dela Croix: It is a major success to have this great alliance with Harley Davidson, a brand that has been an inspiration and creates communities. If you ask me about a great success, it’s this collaboration with an iconic brand that, for me, continues to be an example of true humanity; that allows you to get on your motorcycle and drive wherever with 500 people who you do not know, to the mountain, the beach, and to live in a community brought together by the motorcycle. Nowadays, the world revolves around the telephone. I prefer the world created by the Harley community. R: How you did you make it with Harley Davidson? CEO De la Croix: I am a very passionate person. I fight for what I want. It is strange like a Bomberg product: you could like it or you could hate it. 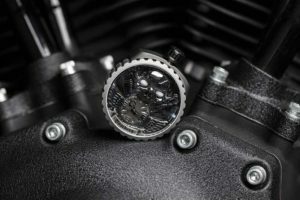 It’s a talking piece that it comes from the idea of creating a pocket watch that turns into a wristwatch and can now be mounted on a motorcycle. It’s something that did not exist. And they (Harley Davidson) understood that what I wanted was to create an interactive, social community. R: We imagine that you have several Harleys. De la Croix: Yes, several! I am a fan, but I approach it like a philosophy. I have many watches, but I am not a fan of time. I am a fan of brands. And thus with motorcycles, I do not only have Harleys. But everything revolves around this philosophy and freedom that a motorcycle gives you to head out, to be released from the telephone and go to one hundred [kilometers per hour] on the freeway and find people who have the same passion. R: Why does Bomberg do so well? Pieric De la Croix: I try to make sure that the client, the fan of Bomberg, communicates [with others] about a product that is captivating and very provocative. I do not make commercial products. [Bomberg] is for the few. It has a niche. I prefer to be very strong within the one percent segment of people who do not want to wear the same jacket as others; the kind of women who, when arriving at an event do not want to see others wearing the same dress; or the kind of men who do not want to see others wearing the same watch. I think that character is lacking in the world; I do not understand people who love to be the same; I like differences. And that’s Bomberg: different.